The MIA has been dogged by controversy since it was first mooted in 1904. A major conflict of opinion was expressed concerning the size of the farms. Originally, provision was made for small horticultural holdings only. Experience has shown the need to diversify forms of production but this can only come about through larger holdings. In this way it is possible to bring large areas of second class land into production under irrigation. 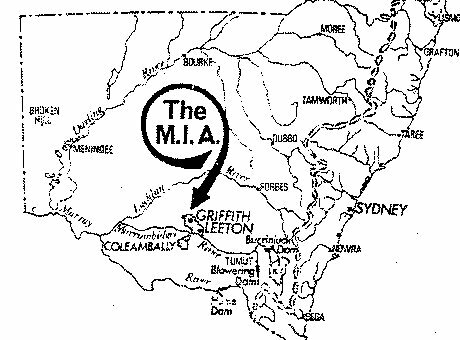 The production of wheat, wool and fat lambs on irrigated farms has added to the wealth of the MIA. RICE: No single industry has however, enjoyed such spectacular success as rice growing. Rice was first tried as an experiment in the early 1920s and subsequently gained favour with large area farmers. The area planted is more than 30 000 ha with an average yield of about 6 tonnes per hectare. Each farm is connected to the Water Resources Commission's (WRC) supply system of about 3 000 km of channels to convey the water from the main canal to farm boundaries. mixed farms of about 180-200 ha on which rice, winter cereals and pastures constitute the major land use. Each farm has attached water rights ensuring a guaranteed minimum amount of water. Additional supplies are available on request and if available. Horticultural farms use about 98 megalitres per of water annum on average compared with mixed farms which use about 895 megalitres on average.